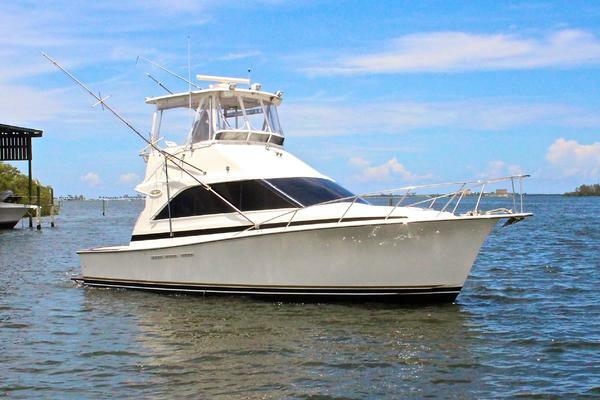 Gadabaut is a classic extended range trawler for enjoyment of the cruising lifestyle. All with traditional Grand Banks quality, design, and propulsion. Very comfortable at the dock or on the hook. The forward stateroom has a very spacious v-berth with hanging locker, drawers, and an enclosed head. Aft of the forward stateroom is a three step companionway that leads up to the galley/helm/saloon/dinette. There are hardwood parquet floors throughout the boat. The large, leatherette upholstered U-shaped settee accommodates six people. Heading further aft down a three step companionway you enter the aft stateroom. There are two berths, one twin and one full, and an enclosed head in the corner. There is also deck access through a door at the rear of the aft stateroom. The main salon is entered from doors both port and starboard. The main salon area consists of the captains computer/radio desk station, entertainment center, L shaped settee seating around the dining table, bar area, inside helm station and galley-up design. This allows the cook to be part of the group while entertaining. The galley up also makes day to day food prep easier with no stairs to climb, and pleasant with the large window views. The port side settee area has been converted to a computer/radio station for the captain’s monitoring of the weather. The main salon cushions have been redone. The white window screen coverings, a textaline material with an open weave that allows ventilation without bugs or no-see-ums, provide shade and privacy. The main salon lighting has been upgraded for comfortable reading. Aft from the main salon, down three built in stairs with storage is the master cabin. While Gadabaut does not have a walk around bed it has floor space between the California twin bunk on port and the full size bunk with pillow-top mattress on starboard. This allows a six drawer chest-of-drawers arrangement with additional under bunk drawer storage. The aft cabin hanging locker is very spacious, and allowing for the custom built-in 2.8 cu ft, 12 volt freezer to be contained without affecting the actual clothes hanging space. The aft head has a vac-u-flush toilet, molded sink counter top and a full sized shower. The refrig and freezer have custom made temperature gauges to monitor the temperatures inside each, with alarms..
12 volt refrigeration and built in 2.8 cu ft, 12 volt freezer built into a locker in the aft cabin hanging locker. Also located in the galley is a Maytag washing machine behind a door. The flybridge area contains the exterior helm station with both forward and aft facing seating. There is a custom starboard dinette table and the two traditional Grand Banks chairs can be moved in to seat four people comfortably. These same chairs are brought into the main salon for seating for four dinner guests. The flybridge cushions have been redone to include Dri-Fast foam. Other additions on the flybridge include starboard dinette and drink holders. The wind screen is new Lexan. The custom dinghy davit allows single handed launching and retrieving of the 10 foot AB inflatable with the 15HP Yamaha. Additional securing straps are used for passage making trips. By not having the dinghy on the cabin top, crew members are able to work the side deck without obstruction. The original dinghy base on the cabin top has been modified to hold kayaks (no kayak included). The aft deck teak has been removed to allow rebuilding of the lazarette hatches and addition of fiberglass decking material. Located in the salon is the entertainment center, a 36 inch flat screen TV, with 5.1 surround sound and a Blue Ray player. There are two GPS's on board. One Garmin 450 chart plotter is located on the bridge, and one Northstar 6000 chart plotter with 15" viewing screen at the inside lower helm station. Autohelm 6000 autopilot, with control heads on the bridge and the lower helm. There are two watermakers, a 240v, 25 GPH Village Marine watermaker, and 12v, 3 GPH Village Marine watermaker. There is also custom monitor gauges for the large watermaker, that monitors the flow and the PPM. Also mounted on top of the custom hardtop, is a solar water heater. The 200 gallons of extra diesel fuel, in three extra tanks located in the lazarette, are transferred by fuel transfer pump into the main tanks located in the engine room. This gives a total of 800 gallons of fuel. The three extra fuel tanks in the lazarette are made of aluminum. There are custom engine gauges for monitoring engine temperature, water flow, and alternator outputs. Gadabaut has twin Lehman 135 main engines, and 8KW Westerbeke generator. Both main engines and the generator have been properly maintained with regular maintenance. There are many spare parts. Both Borg Warner drop center CR2 transmissions were rebuilt in 2006 by transmission marine in Ft. Lauderdale. Injectors have also been changed with rebuilds. The engines are clean, leak no oils. In 150 hours run time, they burn no oil as well. I run them at 1800 RPM which gives me 8 knots speed, and a fuel consumption of about 3.5 to 4 GPH. The 8 KW Westerbeke generator has no problem running the the 240 volt watermaker, the charger/inverter, and the A/C units.